Only a Dalit wave can help Mr Eknath Gaikwad, Minister of State for Health in the Sushilkumar Shinde ministry, win. He is trying to woo the Dalits, most of who reside in Dharavi. A Dalit himself, he strikes a chord among the downtrodden voters. “Joshi promised 40 lakh houses. Where are they?” he asks voters in Dharavi. 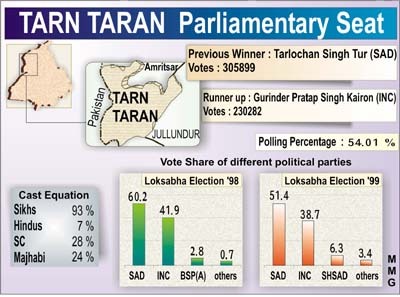 The going is getting tough for the two main contestants, SAD-BJP’s Naresh Gujral and Congress candidate Rana Gurjit Singh owing to the infighting in the Congress and the “lack of coherence” between the ongoing campaign of the SAD and the BJP. The contest in this Jat-dominated constituency will be anything but routine. There will be a direct battle between old war horse Kishan Singh Sangwan and Ms Krishna Malik. While Mr Sangwan is banking on the large-scale development during his past two terms and the anti-incumbency factor against the INLD, Ms Malik is more of a proxy candidate. Pandit Dinanath Shastri feels that political activity should be prohibited in some cities to avoid destroying their spiritual character. Kashi is one of them. Indeed there is something in the air of the ancient city that can turn even a non-believer into a believer. Their sway over politics in Chhattisgarh may have declined but not the will to gain centrestage. At an age when most people prefer leading relaxed, retired lives, the Shukla brothers are fighting probably their toughest political battle. Both the Congress and BJP in Karnataka find themselves in a situation which, though expected all along, is nevertheless piquant as the second phase is a few days away, and the exit polls are giving them both cause for cheer on the one hand and some dismay on the other. The daughters’ Bill seeking to deny property rights to women marrying outsiders and the decision of the Congress supported PDP-led coalition government to withdraw the sales tax exemption to soldiers on the canteen items are the crucial factors for the electorate in the Udhampur Lok Sabha constituency. Malda ‘badshah’a graduate at 9? The seven-time Congress MP from Malda, Mr A.B.A Ghani Khan Chaudhury, can claim a place in the Guinness Book of World Records if his affidavit is taken to be authentic. A former railway minister, Mr Chaudhury, known as the “Badshah of Malda,” had filed his nomination paper yesterday. All the personnel deployed on election duty in Uttar Pradesh will be provided an insurance of Rs 5 lakh each, state chief election officer Vijay Sharma said here. Delhi Chief Minister Sheila Dixit campaigns for Govinda. Students hold unique poll-inspired fashion show in Jaipur. The smile on the face of former Chief Minister of Maharashtra and Lok Sabha Speaker Manohar Joshi remains in place as he greets voters in the Mumbai North Central Lok Sabha seat. With Shiv Sena-BJP bigwigs campaigning for him, he gives the impression of not trying too hard to win the seat. Gujarat Chief Minister Narendra Modi canvassed for him and Hema Malini wowed Tamil migrants in Dharavi with her “vannakam”. Dalit leaders and street-corner leaders are sporting the Shiv Sena flag in his favour. His support base is the Maharashtrian middle-class from Naigaon, Dadar, Matunga and Mahim. The 86,000 structures that make up Dharavi house 93,000 families. It is home to small-scale industries manufacturing everything from readymade food products to stitched garments, leather goods, pottery and plastic and has an annual turnover of over Rs 3,000 crore. Mr Joshi has promised to make Dharavi “shine”. Just before the elections, he got Prime Minister Atal Bihari Vajpayee to launch “Mission Dharavi” which promises to turn the slum into an economic powerhouse. He is wooing Muslims too. “The Congress created differences between Hindus and Muslims. What makes you think we Hindus are against the Muslims,” he asks Muslims in the suburbs of Mahim. He is accompanied by BJP Muslim leaders like Mr Mukhtar Abbas Naqvi. He is hoping that the Muslims will vote against the Congress-NCP combine to oppose the arrest of several of their community members under POTA. Only a Dalit wave can help Mr Eknath Gaikwad, Minister of State for Health in the Sushilkumar Shinde ministry, win. He is trying to woo the Dalits, most of who reside in Dharavi. A Dalit himself, he strikes a chord among the downtrodden voters. “Joshi promised 40 lakh houses. Where are they?” he asks voters in Dharavi. The Congress-NCP combine which fielded Mr Gaikwad is hoping that the minister will be able to harness the anti-Shiv Sena-BJP sentiment in several pockets of the area. “Our candidate would win if we are able to ensure a huge turnout here,” says a Congress leader. The Mumbai North Central seat saw a meager 46 per cent voting in the last Lok Sabha elections. The combine now hopes that a high turnout from the slums, a traditional Congress bastion, will help swing the votes against Mr Joshi. The slum comprises a total of three lakh voters. A section of Congress leaders here fear that a few Dalit leaders may even sabotage Mr Gaikwad’s chances. In the last elections Raja Dhale of the Barip Bahujan Mahashangh polled 23.84 per cent votes. The Dalit votes got split with another Dalit leader, B.C. Kamble, cutting into Mr Dhale’s votes. Dalit leaders feel that this constituency will see a one-to-one fight between Mr Joshi and Mr Gaikwad and the votes will be polarised in favour of Mr Gaikwad. Mr Gaikwad is confident of breaching the middle-class bastion of Mr Joshi. “The residents of chawls and slums will vote for me because they know Joshi has done nothing for them and the middle class is with me because of my clean image,” he says. 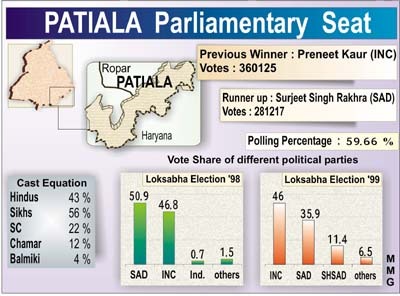 The Patiala parliamentary seat will determine the post poll fortunes of the candidates. Congress candidate Preneet Kaur and SAD nominee Capt Kanwaljit Singh are locked in a contest which will have far reaching political ramifications. The Congress candidate’s result will have a direct bearing on her husband, Chief Minister Amarinder Singh. It is equally important for the Akali leader to win if he is to maintain his position in the party and be in the fray for the top post in the SAD. The elections will also decide who will be the most important leader from the Patiala region as a vacuum has been created following the death of SGPC president Gurcharan Singh Tohra. Capt Kanwaljit Singh is reminding the people that he had been chosen by Tohra and was like a son to him. The Akali candidate has launched an aggressive campaign and is relying on the SAD’s capacity to ensure massive mobilisation in the rural areas. The Congress campaign is relatively subdued and Mrs Preneet Kaur is banking on support from all important Congress leaders in the constituency. The Congress has five legislators to the four legislators of the SAD in the nine Assembly seats. The Congress has to reckon with Rajpura legislator Raj Khurana who is a Bhattal loyalist and had revolted against the party at a recent function. Mrs Rajinder Kaur Bhattal has kept away from the Congress campaigns so far. The Congress wants to present a unified front as is wary about the effect on people once Mrs Joginder Kaur, wife of Tohra, supports the SAD candidate. The Akali candidate claims she will be present when he files his nomination papers on April 23. 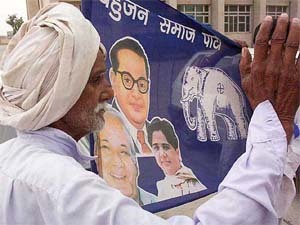 While the main fight is between the Congress and the SAD, the presence of BSP candidate Hargopal Singh Kashyap will also have a bearing on the results. The constituency, spread over the Banur, Ghanaur, Dakala, Patiala, Samana, Shatrana, Lehra Ghagga and Sunam Assembly segments, is mainly rural with Patiala and Rajpura being the two major towns. This goes to the benefit of the Akalis. However, the massive development works carried out in the Patiala and Samana Assembly segments and the bringing in of the Rs 148 crore Ghaggar project by the Congress candidate into the constituency makes Ms Preneet’s chances equally bright. The seat has become a matter of prestige for Chief Minister Amarinder Singh who is close to Rana Gurjit Singh and for former Prime Minister Inder Kumar Gujral following his son’s candidature from the seat. Both candidates are fresh faces and have been non-controversial. The Dalits have a large presence here. Money and the caste factor has played little role in the constituency in the past and voters have opted for parties rather than individuals. A total of 12,21,420 voters form the electorate base here. Approximately two lakh are Hindus, and Rajputs account for 4,000, Sikhs (4 lakh), Mazhbi Sikhs (43,000), Julahas (5,000), Adharmis (2.30 lakh) and Balmikis (1.30 lakh). The presence of BSP candidate Devi Dass Nahar can spring surprises for both the Congress and the SAD-BJP for the BSP has a strong vote bank in the constituency. Mr Balbir Singh who was denied ticket by the Congress and Mr Kuldip Singh Wadala recently joined the SAD-BJP combine. This coupled with Congress infighting can make things difficult for Rana Gurjit Singh. On the other hand, what can prove costly to Mr Naresh Gujral, is the slow movement of the BJP rank and file in his favour and lack of coherence in SAD-BJP campaigns. Time has covered the scars of terrorism on this rural constituency which has the largest concentration of gurdwaras. This place is in news as much for the Lok Sabha elections as for the celebrations marking the 500th birth anniversary of Guru Angad Dev at Khadoor Sahib. 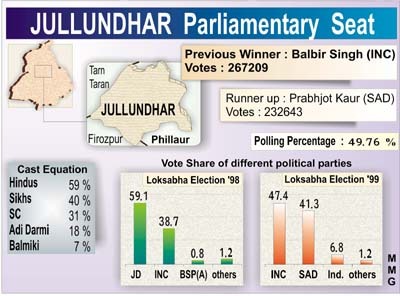 The constituency is poised to witness an electoral battle between Dr Rattan Singh Ajnala (SAD) and Mr Sukhbinder Singh Sarkaria (Congress). Also in the fray is Mr Tarlochan Singh Tur, an Independent, whom the SAD president, Mr Parkash Singh Badal, did not re-nominate. Out of the nine Assembly segments here, five seats are with the Akalis, three with the Congress and one with an Independent who has joined the Akali Dal. This area is perceived to be an Akali bastion. The Congress had won it only once in 1992 when the Akalis had boycotted the elections. This constituency is also known for numerous ‘’deras’’ run by babas representing various sects and these wield considerable influence. Since this constituency has nearly 90 km boundary with Pakistan, it has developed a reputation for narcotics smuggling. At Chola Sahib, a Congress leader said sants and smugglers were a deciding factor and influenced the voters. Smuggling thrive on the nexus between smugglers and politicians, he alleged. Dr Ajnala is considered to be an “outsider” and caste is another factor which the Congress is using against him. He is from Bholath and his own Assembly segment is outside the Tarn Taran constituency. These facts are being used by Congress candidate Sukhbinder Sarkaria against Dr Ajnala. Mr Sarkaria has been the president of the District Congress Committee (rural), Amritsar, and his village falls in this constituency. His priority is quality education and adequate power supply. Besides development, he talks of corruption by Akalis. The recent incident in which a boy of this constituency was killed in police firing at Manawala during a BKU protest, is giving hiccups to the Congress. The boy’s family has spurned the financial offer made by the government. Dr Ajnala said: “Black deeds of the Congress government during the past two years are enough to expose Capt Amarinder Singh. My focus is on development and performance of Mr Atal Bihari Vajpayee.” Dr Ajnala is considered to be the choice of Mr Ranjit Singh Brahmpura, former Akali Minister and MLA. So far, it is advantage SAD-BJP combine. The contest in this Jat-dominated constituency will be anything but routine. There will be a direct battle between old war horse Kishan Singh Sangwan (BJP) and Ms Krishna Malik (INLD). While Mr Sangwan is banking on the large-scale development during his past two terms and the anti-incumbency factor against the INLD, Ms Malik is more of a proxy candidate. The 41 per cent Jat voters in this constituency will decide which way the balance will tilt. Mr Sangwan with support from the Centre and the district is considered to be a stronger candidate. He is the only candidate in the fray who had won elections consecutively in 1998 and 1999 from this constituency. Dharmpal Malik won the elections in 1984 and 1991. The Congress campaign did not gain momentum here due to the delay in the announcement of the candidate. The other candidate in the fray include Mr Jagbir Malik of the Haryana Vikas Party. 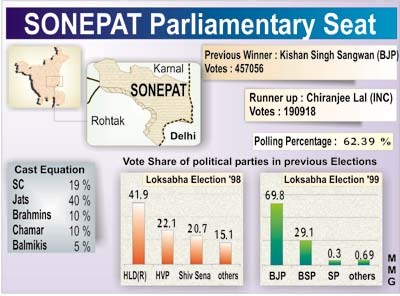 The Sonepat constituency comprises nine Assembly segments. Six are in Sonepat district. These are Rohtak, Rai, Sonepat, Kailana, Gohana and Baroda. One other is the Bahadurgarh segment in Jhajjar district, while Julana and Safidon are in Jind district. Six Assembly segments are represented by the INLD, two by the Congress and one by an Independent. This constituency has about 11 Lakh voters. The elections have become a prestige issue for BJP leaders and Mr Om Prakash Chautala. There is a strong anti-incumbency factor against the INLD as it had failed to provide free electricity and water to farmers as promised by Mr Chautala. Mr Jagbir Malik, former minister in the Bansi Lal government, is banking upon the development undertaken by the HVP during its term. They talk nostalgically about Rajiv Gandhi’s visits to Amethi, the work that he did for the constituency and how he endeared himself to the people here by mingling informally with them. Rahul Gandhi’s presence only serves to bring back those memories. This is a one-sided election here people of Amethi have a great attachment for the Gandhi family. After all, look at the work Rajivji did here, says Uma Shankar Chaube of Shukla Bazar, Rahul Gandhi’s first halt today. But it was his father who initiated all the development work, not Rahul Gandhi, you tell him. Any such remark is dismissed outright. There is no difference between them, after all, he is Rajiv’s son replies Niazuddin of Kishni village while another resident, Shaheen, quickly adds Of course, we will vote him. After all, we walk on the road built by his father. Similarly, any remark about Rahul Gandhi being a novice in politics is also brushed aside. Even Rajiv Gandhi was like this when he first came here but look at the development he did for us, adds Sakina of Kundanpur. As for Rahul Gandhi, he goes through the paces quite amiably, even though he had just recovered from a brief illness. He smiles genially when a villager pulled out an old magazine featuring Rajiv Gandhi’s 1985 visit to Amethi, goes along with a suggestion that he visit a local temple and ate the sweets and kheer especially prepared for him. He laughs easily when somebody points to the Congress buntings and complains that the police would pull them down once he leaves. “Police hai, kya kar sakte hain,” he responds. Having been overshadowed by his sister Priyanka till now, Rahul Gandhi is making a concerted effort to emerge as his own person. Whether it is his informal interaction with the people of Amethi or his impromptu conversations with mediapersons accompanying him, are all aimed at demystifying Rahul Gandhi. For instance, when he was accosted by the press yesterday, he initially said he may not be able to talk to them as he was not feeling well. But once he got chatting, there was no stopping him. It was only when party workers reminded him that they were running late that he moved on. On the response of the people of Amethi: I try to take it with humility. These crowds are more to do with my father and not with me. On his relationship with his sister Priyanka: We think in similar ways. I guess we do work together. We are the best of friends. She’s supportive, she’s good-hearted and sensitive. On what he would like changed in the future: I would really like that one day all persons perceive themselves as equal. I don’t understand how we talk of democracy when people don’t see themselves as equal. I have worked in the UK and studied in the US and the one thing that strike you there is that people see each other as equals. It slaps you in the face when you see how people treat their servants and people of lower castes. There is huge disconnect between the people in the cities and in rural areas. I agree that my relation with the people of Amethi may not be an equal one at present. But give me two years and I guarantee you, it will not be so. On his entry into politics: Nobody can force you to take any decision. I come from a political family and I decided to do something for my people when my father died. I could have taken this step when I was 19 but I felt I had nothing to offer then. Having studied and lived abroad, I bring more to the table today. I agree that there has been a lot of personal tragedy in our lives. But such incidents also make you much stronger as we had to start taking decision very early. On India’s priorities: India needs to compete much more effectively with the South Asian economies like the Chinese. Call centres are okay, but these are mere islands. There is a manufacturing boom which we should be a part of. The problem is that in India, we do not like to take hard decisions. Pandit Dinanath Shastri feels that political activity should be prohibited in some cities to avoid destroying their spiritual character. Kashi is one of them. Indeed there is something in the air of the ancient city that can turn even a non-believer into a believer. You have to visit Varanasi to understand what made Ghalib, the greatest Urdu poet, write a poem in Persian on the glory of Kashi. He called it the Ka’aba of Hind. On the surface, Varanasi is like any other dirty and squalid city of Uttar Pradesh. It faces the same problem of daily load shedding to cope with the shortage of power. 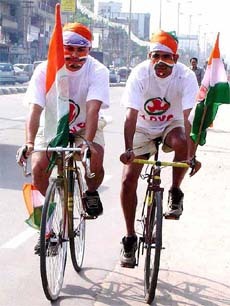 Outsiders usually close their eyes while travelling in any mode of transport on the city’s potholed roads. The car drivers need just a toehold between a rehra on one side and a giant truck on the other to move ahead. Yet, a visit to the ghats is enough to uplift ones spirit. You can feel being transported to a spiritual level of existence. But election time is election time. People like Pandit Dinanath can only pray that it does not get down to a level that would make the gods abandon what is presumed to be the land of their abode. A lone Bharatiya Janata Party flag on a shack on Assi Ghat exemplified Panditji’s concern for protecting the sanctity of the holy city from being injured through thoughtless political activity. As far as the political trends are concerned, the visit of Prime Minister Atal Bihari Vajpayee on Monday seems to have revived the sagging campaign of sitting Lok Sabha Member Shankar Prasad Jaiswal. The unexpectedly high turnout at Mr Vajpayee’s rally has made the BJP workers shed their differences and work unitedly for Mr Jaiswal who is seeking a record fourth term from Varanasi. Mrs Sonia Gandhi’s visit to neighbouring Mirzapur last month has already receded from public memory. The chai shop wisdom does not rule out either Congress candidate Rajesh Misra or Samajwadi Party candidate Anjana Prakash from springing a surprise. Mr Misra has been fielded to win over the Brahmin votes, that is part of the new Congress strategy of somehow evolving its own exclusive constituency of upper castes and Muslim voters. Ms Prakash enjoys the advantage of having been a fire-spitting student leader of Banaras Hindu University. The Congress strategy may have worked had the Muslims of eastern UP been as upset as those of western UP with Mr Mulayam Singh Yadav for having shed his anti-saffron fangs They are not. In fact, the political climate in most of Purvanchal seems to be in favour of the Samajwadi leader. We ran into a local Youth Congress leader and coaxed him into giving an honest assessment. He gave Ghazipur, Mirzapur and Azamgarh to the Samajwadi Party; Robertsganj, Allahabad and Varanasi to the BJP. He gave only the Ghosi seat to the Congress. Faizabad would go to Mr Mitrsen Yadav, who has won several elections from here on the Communist Party ticket. This time he is contesting as a BSP candidate. Mr Shayama Charan Shukla and Mr Vidhya Charan Shukla (74) began their legislature innings in 1957 after the death of their father Pandit Ravishankar Shukla, who was the first Chief Minister of Madhya Pradesh. The older brother was involved in state politics while younger was active at the Centre. The arrangement worked smoothly until 1999 when Congress President Sonia Gandhi preferred Mr S.C. Shukla over his younger brother to contest the Lok Sabha elections from Mahasamund. Mr V.C. Shukla was further hurt by the denial of his claims to the post of Chief Minister when Chhattisgarh came about in November 2000. Having joined the NCP before last year’s Assembly poll with a view to ousting the Ajit Jogi-led Congress government, Mr V.C. Shukla thought it wise to join the BJP before the Lok Sabha poll. His determination to fight these elections from Mahasamund, a constituency represented by him seven times, forced Mr S.C. Shukla to shift to neighbouring Raipur. The BJP was keen to accommodate Mr S.C. Shukla too but such suggestions were rejected by him. The brothers have not spoken against each other and have not campaigned in each other’s constituency. Pitted against hat-trick achiever Ramesh Bais (BJP) in Raipur, Mr S.C. Shukla has found the going tough Seven-time MLA from Rajim in Mahasamund, he mostly talked of the work done by him during three tenures as Chief Minister in undivided Madhya Pradesh. Never personal in his attacks, he commands respect of his rivals. Age may have slowed down his pace, but he shows no shine of exhaution. Mr V.C. Shukla draws the youth. Most of his followers are in their twenties and thirties. He was made a minister by Indira Gandhi in her first ministry in 1966. He was expecting an easy win in Mahasamund where he last contested in 1989, until the Congress fielded former Chief Minister Ajit Jogi against him. Karnataka is known for the so-called ‘split voting’ pattern where voters in many constituencies vote one way for the Centre and another for the state government. The general expectation, backed up subsequently by many opinion polls, was that the BJP would make significant gains vis-à-vis the 28 Lok Sabha seats, and the Congress, while losing some seats in the 224 strong assembly, would make it back, though it may be a little close. What that means is both parties are attempting to create anti-incumbency on one front, while boosting incumbency on the other, but in opposing directions. Another interesting parallel between the parties is that both of them, in boosting incumbency, are relying on a leadership personality — Mr Vajpayee for the BJP and Mr Krishna for the Congress, both of whom have a large personal popularity base. 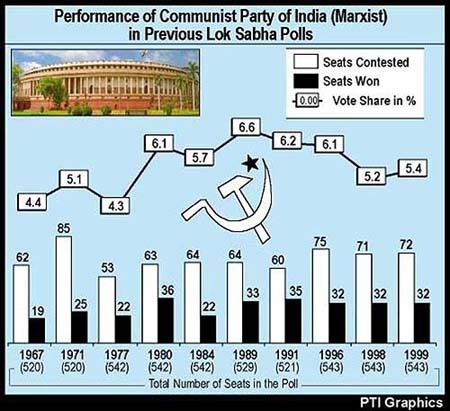 In the first phase on April 20, 15 LS seats and 120 Assembly seats went to the polls, and the NDTV-Indian Express poll conducted by A.C. Neilson indicates that the BJP will win 11 of the LS seats, with three going to Congress and one to former P.M. H.D. Deve Gowda. The Congress won 18 in 1999, with the BJP winning seven. The BJP may be on course to winning 19-21 seats. As for the Assembly, it is projected that the Congress will get 110 to 120 seats, (113 is required to form the government), losing many seats out of its 1999 tally of 132. The BJP-JD (U) alliance is projected to pick up 60-70 seats — it won 63 in 1999. Mr Deve Gowda’s Janata Dal (S) doing better than last time, may gain several seats, reaching 25-35. On Thursday, repolling was on in 71 booths in Karnataka, including 22 booths in Bangalore North and South constituencies, which witnessed various disruptions, largely arising out of voters names missing from lists. The Congress, which has all along been maintaining that it is not considering any alliances for the state government, is relieved, but not complacent. But in any case, the Biblical adage of the left hand being kept ignorant of what the right hand is doing is taking on a new meaning for the parties — can the right hand’s victories help the left hand in the state’s second and last phase on April 26? The voter, presumably, is sitting back satisfied with his or her discretion and thought in making choices. The Vajpayee factor in certain areas will benefit the BJP candidate and Minister of State for Defence, Mr Chaman Lal Gupta, but the firebrand Lal Singh, Health Minister and Congress nominee, has certainly made a dent in the constituency. Mr Bhim Singh, Chairman of the Panthers Party that is a partner in the coalition, is campaigning against the Congress and BJP. Fears are being expressed that he might turn out to be a spoilsport for Mr Lal Singh as both of them belong to the Rajput community. However, Mr Lal Singh enjoys the support of other communities too because of his firm handling of the Health Department. A coal kiln labourer, Kesho Ram, on the Jammu-Pathankot highway curses the Mufti-led government for having brought the daughters’ Bill that denies state subject rights to women marrying outside J&K. He says that many girls, particularly from Kathua, including his two sisters, were married in the neighbouring Pathankot and Gurdaspur towns of Punjab. The Bill passed by the Assembly within six minutes had sealed their fate. The illiterate labourer is aware of the developments and the manner in which the Congress and the Panthers Party have supported the Bill. Former soldiers, Dhian Singh, Ralia Ram and Humum Chand, are critical of the J&K Government for withdrawing in a phased manner the sales tax exemption that the defence personnel were provided throughout the country. They have taken the decision as an insult to the soldiers who are fighting terrorism in the state. Dhian Singh says such decisions of the government smell foul as the privileges of the soldiers are being withdrawn by the coalition government that is showering cash incentives on terrorists who were involved in the killings of innocent men,women and children. The Udhampur constituency sprawling over the districts of Kathua, Udhampur and Doda has at least one soldier from almost every household and the decision of the state government is being taken as an insult on them. They point out that the Congress that claims to be a representative of Jammu, should not have supported such decisions of the government. With many areas of Kathua district being on the Indo-Pakistan border, the issue of the failure of the Central Government to provide relief to the border residents who had migrated to safer places during the build-up of military on both sides about four years ago was also an important factor. It is being alleged that while the Central and the state governments were worried only about the Kashmiri Pandits who had migrated from the valley, the border migrants of Jammu had been neglected. The Congress campaigners are claiming that the state government had sent a comprehensive rehabilitation scheme for the border migrants to the Centre, but no response has so far come on it. The failure of the successive governments to supply tap water in hundreds of villages in the Kandi areas of Kathua and Udhampur is worrying the women in particular as they have to carry water pitchers on their heads from distant sources. The denial of a degree college at Billawar in Kathua district has also become a poll issue. Completion of work on the 53-km long Jammu-Udhampur rail line by the NDA government is being projected as an achievement of the BJP. The construction of the road between Basohli in Kathua and Bhaderwah in Doda district by the Army has also come as a credit for Mr Gupta. According to the affidavit, he was born in 1935 and passed his Matriculation examination in 1940 from Salar School in Murshidabad. At the age of seven, he passed the intermediate examination from St Xavier’s School in Kolkata and graduated in 1944 (at the age of nine) from Behrampore K.N. College. Parliament records maintained by the National Informatics Centre, however, say that Ghani Khan was born in 1927 and he is 77 years old and not 69 years as mentioned in the affidavit filed with the Election Commission. His sister Rubi Noor, a Congress MLA, says she does not have any knowledge about his brother’s biodata which she claims was prepared by her brother’s chief election agent Masidur Rehman at the time of the filing of the nomination paper. Mr Masidur, however, says that he had drafted the affidavit after consulting the leader he did not cross-check the record.